We went out to Carizzo Plain National Monument this past weekend (April 15, 2017) to catch the ongoing wildflower super bloom. From the SF Bay Area, it’s a fairly long drive… about a 4.5 to 5 hour drive each direction. But with news and amazing pictures of yellow, orange, and purple flowers of the ongoing super bloom, I had to drive out to see it in person. The sooner the better, because similar to Cherry Blossoms on the East Coast, the blooming wildflowers aren’t expected to last very long. Due to the last second nature of the trip and time constraints of the group, we opted for a day trip, 6am departure from the Bay Area. We spent about 10 hours in the car total and spent about 3-4 hours out and about in the park… it was a long day! From the North, we drove south on 101 to the 58. 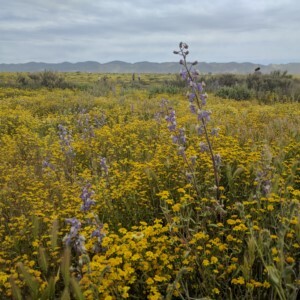 From there, we go on Soda Lake Road where wildflowers can be seen right off the road around Soda Lake and even far off in the distance on mountains. We ended driving on the dirt roads of San Diego Creek and Elkhorn Road. This eventually led to 7 Mile Road where wildflowers can also be seen off the road (though this area was VERY crowded). Unfortunately, by the time we visited, most of the purple and orange flowers had already dried up. The best was about 1 week before. But the yellow flowers were still out in full force everywhere. We took tons of pictures! Surprisingly with all the flowers, my allergies were not any issue, but be prepared with non-drowsy anti-histamines if it’s a concern. There were very small patches of orange and purple wildflowers, but there aren't enough to overpower the landscape of yellow flowers. This was also the first time I experienced walking on a dried salt lake, which was an added bonus. The dried lake bed was surprisingly bouncy and the white salt was soft and powdery. The weather was mildly hot (70-75 degree F) with no tree cover, but the heat wasn’t as crazy as I’d imagined (was expecting hot and dry desert weather). This was also the first time driving on a lot of dirt roads and my 2006 Toyota Camry Hybrid had no problems, though we were going only 20-30 MPH most of the time. Don’t expect the same level of service that you get for visiting Yosemite National Park. The line for the bathroom was about 10-15 people long and it’s recommended you bring your own toilet paper as it’s possible for it to run out. Bring your own food and drinks as nothing is sold in the park. We packed lots of snacks, bottled water, and a couple sandwiches per person to munch on when we got hungry. Prepare to bring your own trash out of the park. There aren’t trash cans in the park, so bring a plastic bag to carry out your trash. Depending on how long you stay and how far you plan on driving, have a full tank of gas. The nearest gas station may be an hour away. Dog friendly! Bring Fido (or Waffles). As long as you leash and pick up after your dog, they are allowed on the paths. And we saw tons of dogs of all sizes on our daytrip. There’s a main paved road that runs through the park, but most roads and parking lots of dirt. Note that travelling over dirt roads is slow and dusty, so if you are OCD, be prepared to run the AC and keep the windows rolled up. A car wash on the way out may be nice too! There are other activities in Carizzo Plain National Monument, such as visiting Fault Line, Visitor Center, and Cave Paintings. However, since our trip was spawned in only 3-4 days, our trip focused primarily on the wildflowers.